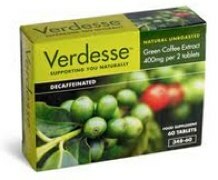 Verdesse is a commercial brand of green coffee bean tablets that are very focused towards to the UK. They appear to be exclusively sold via one web based outlet and are priced competitively at around £15 for 60 tablets which is enough for one month. 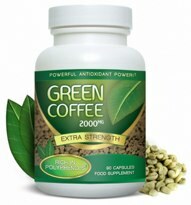 The concept of using green coffee bean extract diet pills has really been a focus of the media of late with the UK, America, Canada and Australia all highlighting its weight loss potential and weight loss benefit. Verdesse has appeared in the media with an article in the Daily Mail being arguably its best piece of PR. The article labels it as being the £14 diet pill that the celebrity circuit are using. The main ingredient is a decaffeinated green coffee extract called Svetol. It contains high quantities of chlorogenic acids otherwise known as GCA. 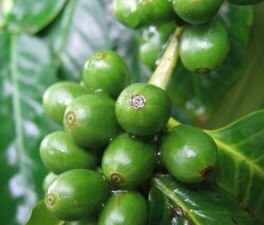 A green coffee bean is basically the same a regular one but it is in its raw, un-roasted and natural state. The green un-roasted bean can have a profound and significant effect on the fat burning process. It can help to suppress and appetite and is very efficient and effective detox agent. Chlorogenic Acid (CGA) long known as an antioxidant, also slows the release of glucose into the bloodstream after a meal. Experts within the weight loss industry are very positive about the effect green coffee is having. US TV health expert Dr Oz is extremely complimentary about it. Watch and listen him describe what green coffee does. All diet product pose the risk of side effects if taken in disregard to the manufacturers direction. Should not pose a risk to health. Pregnant and nursing mothers should avoid. Green coffee bean tablets can vary in strength and price and quality. Not wishing to dismiss Verdesse but a higher strength product can be purchased elsewhere. Verdesse contains 400mg around a quarter less than the current market leader. Appears to be available solely via the Natures Best website. Not available to buy on the UK high street, Boots, Holland and Barrett and Superdrug are not stocking. Customers based in the UK are advised to consider Evolution Slimming’s Green Coffee CGA – arguably the highest strength brand with the equivalent to 2000mg. It costs approximately £2 more than Verdesse but is over 4 times the strength. It is guaranteed for 30 days and a free 7 day diet plan is included with every order.